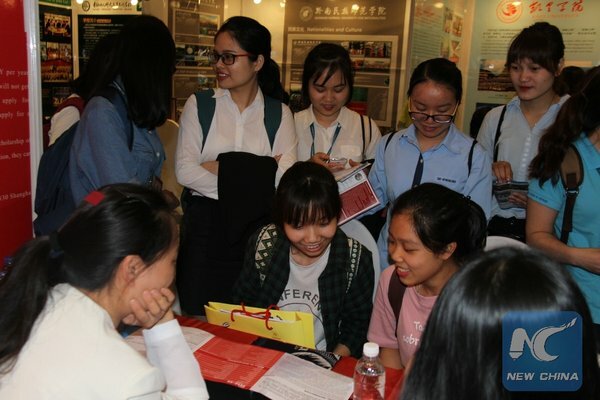 HANOI, April 28 (Xinhua) -- Many Vietnamese students seemed particularly interested in the possibility of studying in China as Xinhua noticed in a "Study in China" (Guizhou) education fair within the framework of the 9th China-ASEAN Education Cooperation Week held in Vietnam's capital Hanoi on Wednesday. "I have visited all the booths here to learn about education opportunities at universities in China's Guizhou. There are many schools that I can take into consideration to apply for a scholarship," Doan Thuc Huyen, a 17-year-old Vietnamese student, told Xinhua. "There are plenty of opportunities to study in China with various majors to choose from," Huyen said. The young Vietnamese student showed a particular interest in Guizhou Normal University. "After talking with teachers from Guizhou Normal University, I am quite interested in this university and I will learn more about it." "I think that studying in this university will help me have more opportunities to seek for a job in Vietnam after graduation," Huyen said, adding that it is because the quality of education in China is good. "As Vietnam and China are two neighboring countries, the economic cooperation potential between the two sides is huge. The need for human resources with knowledge in Chinese language will become higher along with the development of bilateral relations," Huyen told Xinhua. "I want to become a Chinese language teacher or an interpreter. I can help bring people of the two countries closer together," Huyen told Xinhua about her ultimate Chinese dream. According to Pham Chi Cuong, deputy director general of the Department of International Cooperation under Vietnam's Ministry of Education and Training, Vietnam and China have cooperated in many areas, including education. China has granted many scholarships to Vietnamese students over the past years. "Many students who returned to Vietnam after studying in China have made many contributions to the renovation and development path of Vietnam," Cuong said. At present, there are some 160 Vietnamese students studying in China's Guizhou. Through this education fair, students can learn more information about the opportunities available to study in China Cuong added. Nguyen Thanh Van, a Vietnamese student who is studying in China's Guizhou University, said that he has learned a lot during his time in China. "Studying in Guizhou is the right choice for me. After graduation, I think that I can be more confident to secure a god job," said Van, who has studied in China's Guizhou for two years and a half. "During my time in China, I have made many new friends there and from other different countries. I have learned more about Chinese culture, as well as many important skills which can help me later in work and in life, Van said. "I am very interested in studying in China. I plan to earn a scholarship to go there to study tourism," Phan Thi My Linh, 17, told Xinhua. Meanwhile, Tran Huyen Trang, another Vietnamese student said "As Vietnam and China are very close, the cultural features of the two countries are similar, so it is quite easy to adapt." Trang is also interested in teacher training majors in China. With language skills and knowledge learned during his time studying in China, Truong Tien Hai, 35, has found his own business in tourism. "After studying in China, I was able to open a travel agency tailored specifically to the needs of Chinese tourists to Vietnam. The time spent studying in China helped me a lot," Hai told Xinhua. As many as 22 Chinese universities and colleges attended the education fair in Hanoi on Wednesday.